Zenica 2038 is a twenty-year plan for the revitalization of Zenica and Zenica-Doboj Canton as the Regional Center for Wood Industry and the Museum of the Industrial Heritage of BiH. It looks at Zenica historically, currently and within a future narrative of a wider shifting Europe. It addresses the competition brief at different levels both today and in 2038. At National Level. The project considers a possible trajectory to European Union integration and how Bosnia and Herzegovina can play a key role in the development of a European wide wood industry and new sustainable production methods. At Canton level. It looks at Zenica now, with high unemployment, the redundant steel industry and dangerous levels of pollution, and offers an alternative future. Considering Zenica as the heart of Bosnian industry during Yugoslavia, Zenica 2038, repurposes some of the now abandoned factories into centres for new training and manufacture for the burgeoning wood industries in Bosnia and Herzeovina. It continues to consider Zenica as part of a wider narrative, that of the Canton and state level. 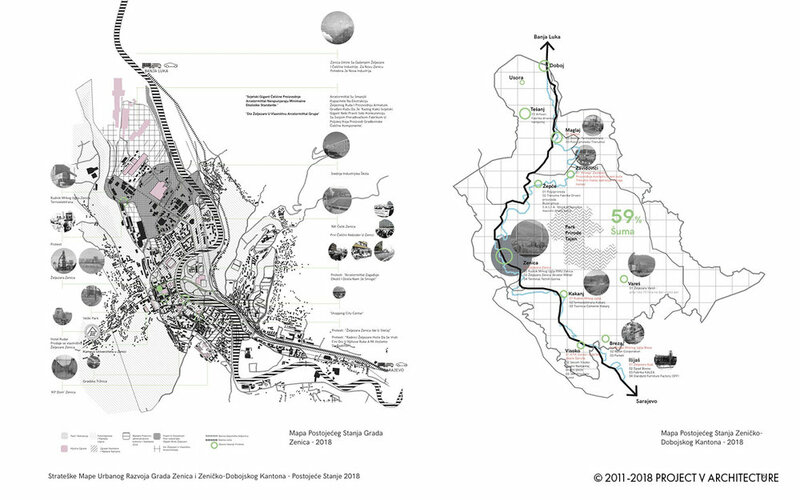 Tracing the industrial railway line that travels through Zenica and up and down the country, the project shows the possibility for the Zenica-Doboj Canton to become a regional centre for cultural and industrial heritage by repurposing large old factory buildings as cultural and creative centres. At a city level. The project suggests the expansion of the current park to the North to bed the new Town Hall proposal and shape the public square element, creating a more dynamic urban context for the new building. At Building level. The proposal aims to push the new wood industries of Bosnia and Herzegovina. It is a CLT construction based on off-site prefabricated elements. It creates a nuanced social system whereby the Council workers and local public can constantly view each other as they circle the main atrium on alternative sides. In doing this, we offer a sense of transparency to the people, of the Council operations. Another offer to the public is the creation of ‘third space’. Spaces within the building which can be used by the community as homes away from home, to work, train, meet and be. The publicly and freely accessible rooftop garden offers back to the community views of the City and empowerment.